Reenergize your at home workouts with the New Dip Bar Fitness Station and Bodyweight Resistance Trainer Package from Ultimate Body Press. It's the ideal upgrade if you already own a pull up bar. Redesigned with a bold new look and new performance features, the Dip Station and Bodyweight Resistance Trainer package provides comprehensive low impact full body HIIT workouts. Dips, Body Weight Rows, Knee Raises and Ring Push Ups on the Dip Station are top compound bodyweight exercises that build lean upper body and core muscle fast. Moving the suspension trainers to a doorway or pull up bar opens up additional bodyweight exercises like assisted pull ups and one leg squats, bicep curls, ab roll outs, the standing chest press and more ? 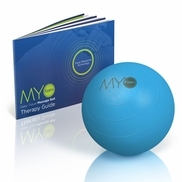 26 exercises are detailed in the included full color guide. If you are ready for new inspiration and the right results in your home gym, order the Dip Station and Bodyweight Resistance Trainer package today. Effective at-home strength training for the chest, shoulders arms, back and core begins with a Dip Station designed for performance. Rigid construction and open asymmetric frame gives you immediate access to the best and most highly metabolic compound bodyweight exercises: Chest and Tricep Dips, Body Weight Rows and Knee Raises. Assisted exercise variations let you complete full dip sets right from day one and bodyweight rows balance your back and shoulder development with your chest and arms. The Ultimate Body Press Dip Bar is supported with our workout guides and over 100 free workout videos. Expand your Dip Station exercises for full body results with the new suspension trainer system from Ultimate Body Press. Commercial grade components include two independent suspension straps index stitched for fast even adjustments, heavy duty cam buckles and high strength handles with integrated foot loops. Innovative Lay-Flat Handles and hardware layout follow body contours to prevent contact with buckles for enjoyable workouts that promote optimum form. Anchor using the Dip Station, doorways, pull up bars, rafters, beams, outdoor park structures ? even tree limbs. 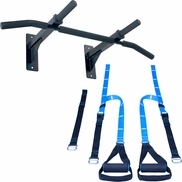 Single point utility strap anchoring lets you workout in any location while independent quick-connect 'S' hook anchoring lets quickly connect to the Dip Station for fresh challenges with Ring Push Ups, Chest Flyes, Planks, Pikes and more. Comprehensive exercise guide includes 26 movements and 3 sample workouts. Be inspired by fresh results right from your first workout with innovative gear and training by Ultimate Body Press. Satisfaction is guaranteed, order your Dip Bar and Suspension Trainer package today. New Dip Station & Bodyweight Resistance Trainer Package4AlexisJanuary 18, 2013The dip bar works great. I've used it frequently and it is sturdy. New Dip Station & Bodyweight Resistance Trainer Package5BradJanuary 7, 2013I am very very satisfied with the Dip Station. As others stated, it seems a bit wobbly at first, but once your weight is on it, it is very very stable. I am 225 and have absolutely no problems with it. It is built to support a lot of weight. The Push Up rings are Ok with the Dip Station, but are outstanding when attached to a door frame pull up bar for rows. All kinds of applications for them. Once again, very well made and very sturdy. I am more concerned with my door frame or my pullup bar coming unhooked than I am with the rings failing. Very good product that I would recommend to anyone. New Dip Station & Bodyweight Resistance Trainer Package5Billy CSeptember 7, 2012This is a great addition to my home gym. It does exactly as descibed. If used properly, you will see great gains in strength. I LOVE IT!!! New Dip Station & Bodyweight Resistance Trainer Package51August 21, 2012I like it...very good for dips and rows, although it feels like you work the bis better than back..
New Dip Station & Bodyweight Resistance Trainer Package5MiguelJuly 9, 2012Great tool for home gym. Very happy with it. New Dip Station & Bodyweight Resistance Trainer Package5Tandra M. MendezApril 27, 2012Very, very pleased with all items. Thank you. New Dip Station & Bodyweight Resistance Trainer Package3SCApril 16, 2012Solid, but a little wobbly once assembled. Found that I really like the rings and use them more with my door pullup bar. Hand pads could be a just a little thicker. Overall, satisfied with product. New Dip Station & Bodyweight Resistance Trainer Package5ChristineApril 12, 2012The dip bar is fantastic - I highly recommend it for anyone who is looking for a home workout. New Dip Station & Bodyweight Resistance Trainer Package5Joe larkinMarch 30, 2012The dip bar is very solid and slanted inward like at the gym (Vshaped slightly). The push up rings give you a very unique movement for the chest. I would recommend these products. New Dip Station & Bodyweight Resistance Trainer Package5Mike MarinMarch 8, 2012Unit nice and sturdy when assembled. Folds up nicely. Does the job I bought it for. I'm happy with my purchase. New Dip Station & Bodyweight Resistance Trainer Package5MikeFebruary 23, 2012Works awesome, bigger people might find it a little small for certain exercises. New Dip Station & Bodyweight Resistance Trainer Package5L WongJanuary 31, 2012I've been looking for something like this for a long time. Amazingly sturdy, quickly assembled and disassembled. Total upper body workout and core can be accomplished with the body press. New Dip Station & Bodyweight Resistance Trainer Package4Don AndersonJanuary 28, 2012Works as well as I thought it would. Easy to put together. New Dip Station & Bodyweight Resistance Trainer Package5RossJanuary 15, 2012I'm very impressed with the quality of the product. Its sturdy, well designed and very stable for every move you can imagine. Shipped very quickly also! New Dip Station & Bodyweight Resistance Trainer Package5Daniel PDecember 28, 2011Easy to put together, well made and design. Wow what a great upper body and core workout !!! Excellent way to get a workout in your home without having to pay to go to the GYM, Great Value....Thank you and Thank you............Daniel P........with a big smile ... ... .. . . . . .
New Dip Station & Bodyweight Resistance Trainer Package5D. AveryNovember 30, 2011The dip bar and push up ring package came exactly the way it was advertised. It was what I expected and wanted. No problems, works out well. New Dip Station & Bodyweight Resistance Trainer Package4MarvinSeptember 16, 2011It good tool for upper body workout and doesn't take much space. New Dip Station & Bodyweight Resistance Trainer Package5Eric WinklerSeptember 15, 2011Excellent product. Efficient way to add dips to my home workout without taking up much space. New Dip Station & Bodyweight Resistance Trainer Package4ash crossAugust 15, 2011This product is really good. I�ve been performing body weight exercise for a long time. Dips and pull-ups are the best for my growth and strength. Before, I could never get my arms to grow, so this product will facilitate triceps and biceps you might admire on MMA fighters. And a side effect is a thick back and some nice pecs. It doesn�t happen overnight, so you have to work at it. This rack makes it easy, even if you are not able to perform a dip or a pull-up. Drop your feet and spot yourself. No gym and similar results. Don�t waste your money on expensive dumbbells, use your body weight for faster results�seriously!!!!!!!! Oh did I mention this product works? One thing that needs improvement is the push-in locking buttons. I am afraid they are weak and will not last long. I want to replace them with screws. UBP Response: Thank you for the great feedback. We think the push-in pins will last for you, but please let us know if you have any trouble. Feel free to post some pics of your "MMA Arms"" on our facebook page." New Dip Station & Bodyweight Resistance Trainer Package5AdamJuly 4, 2011Awesome product i have recommended it to all my friends. New Dip Station & Bodyweight Resistance Trainer Package4christineMay 2, 2011The Dip station itself is great!! I find it does wobble alittle, but once your weight is on it ,it is steady. I do have a problem with the push up rings. There are no instructions on how to attach them to the dip station. When I hook them on they seem terribly unstable. I am a woman with a smaller frame, but I am afraid I may fall using them. Overall... I am happy with the frame itself and I do recommend it for anyone who enjoys working out at home. It is versatile and very functional!! Nice product! UBP Response - Thanks for the feedback. You can find instructions for using the rings in our workout section. http://www.ultimatebodypress.com/ring-push-up.html. If you have never used a suspension product like push up rings, it feels very different because you have to use stabilizer muscles. Sne us an email and we can discuss it in more detail. New Dip Station & Bodyweight Resistance Trainer Package5Eric newtonApril 28, 2011I purchased 2 months ago and use almost daily and i have increased my reps in triceps double at the gym (when I go for a different workout)..can see the difference..it works great and the push-up rings are also great! New Dip Station & Bodyweight Resistance Trainer Package4Adam - London, UKMarch 27, 2011Quick delivery, easy to set up. Brilliant. New Dip Station & Bodyweight Resistance Trainer Package5Tim SmithMarch 26, 2011It's the best portable exercise equipment for the upper body hands down. It will build your upper body if you don't quit. I love it. Work out every Mon. thur Fri. with it. The dip rings make doing push ups super intense. If you ever did dips before you know what they can do and this Dip Bar delivers. It's worth ever penny. New Dip Station & Bodyweight Resistance Trainer Package5Eddie AMarch 12, 2011Grab this if you want to build your body especially the UPPER body. It will teach you how to get strong and cut. New Dip Station & Bodyweight Resistance Trainer Package4TimMarch 7, 2011I found this to be a very practical and easy to use piece of exercise equipment. The assembly guide is easy to understand w/ the colored stickers and the parts fit well together. The Push up rings are great for targeting the 2ndary muscles for balance and coordination. They work wonderful. I would recommend these products to anyone who wanted to target their upper body w/ minimal space to work out in. New Dip Station & Bodyweight Resistance Trainer Package5GraemeMarch 1, 2011Happy with the quality of the product and once its together it good stability. New Dip Station & Bodyweight Resistance Trainer Package5Derek M.January 31, 2011Excellent product! I thought it might be a little too loose at first once I starting using it regularly, but it remains sturdy. Great combo with the push ups and lots of variation possibilities. Already incorporated into my home workout routine. New Dip Station & Bodyweight Resistance Trainer Package4DebbyJanuary 12, 2011Once I figured out how to put the Dip bar together it was great. Very stable. Having a picture of the assembled item with the instructions would have been helpful. Due to the angle of the drawing it was a little confusing. I went to the website to see what it was supposed to look like after assembled. I had to re-glue the velcro strip on one of the push up rings as it was barely attached, but other than that everything was OK, and went together very easily. I would recommend this package to a friend as I think it is going to last and be well used for years to come. 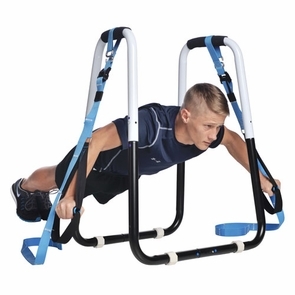 New Dip Station & Bodyweight Resistance Trainer Package5ngiffinJanuary 2, 2011This is a fantastic item that allows for intense exercise. . The design engineer certainly made excellent use of Physics, resulting in a very sturdy component. Furthermore the Dip station has not shown any signs of failure due to lack of compressive strength, thus indicating a proper material was chosen for construction. But I digress, and highly recommend this Dip Station. New Dip Station & Bodyweight Resistance Trainer Package5SarahDecember 29, 2010I love this item for body weight exercises and interval training. Easy assembly. New Dip Station & Bodyweight Resistance Trainer Package3Mr BeteoDecember 27, 2010This product is good and will work very well for those that choose to use it however it could be improved upon by adding better documentation and or a DVD. New Dip Station & Bodyweight Resistance Trainer Package5RTDecember 14, 2010Very compact and sturdy. Also allows me to do dips, inverted rowing without have to go to the gym. The rings give new meaning to push ups and the plank. New Dip Station & Bodyweight Resistance Trainer Package5David JimenezDecember 7, 2010the dip bar n push up ring package is awesome. every time i use it i can feel myself getting stronger. a must for body weight exercise enthusiast's. if u truely want to be a beast i highly recomend this equipent. New Dip Station & Bodyweight Resistance Trainer Package5PierreNovember 26, 2010Command� le 2 et re�u le 12 novembre. En quelques mots : - le colis est propre - l'installation est tr�s simple - le mat�riel est super solide - j'ai commenc� quelques s�ances de dips, abdos, dos, trap�ze, etc... et je suis vraiment tr�s satisfait. Bilan : frais de port tr�s �lev� pour une livraison en France mais c'est exactement ce que je voulais. Tr�s bon mat�riel. New Dip Station & Bodyweight Resistance Trainer Package5CherylNovember 25, 2010Decided to purchase this because they are used in the BODYROCK TV workouts with the pushup accessory. Really stable unit and very easy to put together. However, I am very petite, and I do find that one more adjustment to make the bars closer together would be nice -- they are a little far away for me to be able to do the triceps dips with perfect form. However, I would still really recommend this for value. New Dip Station & Bodyweight Resistance Trainer Package4MotownNovember 24, 2010Easy to assemble, rigid and durable, padded handles will eventually need to be replaced. Small foot area for storage. Great work out though with bar and rings. New Dip Station & Bodyweight Resistance Trainer Package4PatrickOctober 12, 2010Product as expected. Though not gym quality, it is sturdy, even for someone over 230 lbs. I was able to complete knee raises and dips with no worries. The Push Up Rings are more than worth it--my arms were shaking and I could use the rings with my pull up bar. Best of all, I can complete a quick and vigorous workout without traveling to the gym. New Dip Station & Bodyweight Resistance Trainer Package5Steve greavesOctober 7, 2010After doing some research on the old 'net, I discovered this product. The reviews were ALL good and it was just what I needed for my home-training! Although shipping to the UK cost a bit - it was WELL WORTH the money! It is really sturdy and well-made. I can now do 15 reps, so I use a small dumbell for resistance. The rings are good too: They use a lot of stabilising muscles and give some variety to the workout! I am 100% pleased with this dip stand and I would say to anyone interested...BUY IT NOW!! Cheers! New Dip Station & Bodyweight Resistance Trainer Package5Alan HSeptember 20, 2010It's great and very sturdy but a little strenuous for me right now. I'm slowly building strength for this dip bar and building muscle at the same time. New Dip Station & Bodyweight Resistance Trainer Package5Lee SantoJuly 22, 2010I have had my Ultimate body press for a couple of weeks now. First I was impressed with the simplicity of the design. I was able to snap right together no tools needed. Much appreciated. I like how stable the press is considering how small and light it is. I like the push up rings as well. Very sturdy. I weigh 175 lbs. right now and both the press and the rings hold me up very well. In my opinion this is a high quality piece of equipment for a resonable price and is a great nad much needed addition to my "home"" gym. Thanks! Lee Santo"
New Dip Station & Bodyweight Resistance Trainer Package5Bertram MartinJuly 12, 2010Very happy with the product thus far - stable, lightweight, easy to assemble and use. New Dip Station & Bodyweight Resistance Trainer Package5JessJuly 6, 2010Hey I just recieved the Ultimate Body Press last week, and oh boy do I feel the burn after a couple of reps. I also absolutely love the push up rings as well. It only takes a few minutes to assemble and very sturdy. I love this product, well worth the price and I would highly recommend it to anyone who wants to get on a solid workout. New Dip Station & Bodyweight Resistance Trainer Package5mikeJuly 5, 2010ive been using the body press for a few weeks now. absolutely love it. It is a great compliment to my pullup bar. New Dip Station & Bodyweight Resistance Trainer Package5MattJune 5, 2010I already owned a pull-up bar and I finally ordered my Dip Station about a month ago. I am so pleased with it. The station allows for chest/triceps/serratus dips, body-weight rows, and eventually hanging push-ups when my rings arrive. For anyone doing a push-pull workout there really is no better piece of equipment to get started. Combined with the pull-up bar, a good jump rope, some resistance bands, an interval timer, and good music, your workout is bound to take off. New Dip Station & Bodyweight Resistance Trainer Package5Augusto AguileraJune 1, 2010I've been using the UBP for about 1 month now and i must say that the results are incredible , all i have at home is a pull up bar a set of dumbbells with different weights and push up bars, between these 4 things a high protein diet and some cardio the results i'm achieving are amazing. I'm what you call a hard gainer, it is very hard for me to gain any kind of muscle. I tried heavy weights for a few months and i saw some results but since i changed my workout routine i'm seeing way faster and more define results. i would definitely recommend this product to anybody. I can't wait to try the push up rings, i'm sure the increase on chest definition will be even better. New Dip Station & Bodyweight Resistance Trainer Package4mikeMay 24, 2010Well made, a useful piece of home gym equipment. Easy to assemble. Push-up rings are still on back order until June 2010 otherwise a 5 star rating. New Dip Station & Bodyweight Resistance Trainer Package5KaitlynMay 11, 2010This is very portable and sturdy. It can hold up to 300 ib! i love it! New Dip Station & Bodyweight Resistance Trainer Package4jeffMay 6, 2010this is a great product! - i love the ultimate dip bar! New Dip Station & Bodyweight Resistance Trainer Package5Andrew BrownApril 20, 2010Great addition to my workout routine. It is stable and being able to take it apart is ideal for my small space. New Dip Station & Bodyweight Resistance Trainer Package5Triell NguyenMarch 4, 2010I love it. My arms are much bigger now and I feel great. It's easy to put together, use and was a good investment. Great idea whoever thought of it. New Dip Station & Bodyweight Resistance Trainer Package5Robert MarksFebruary 17, 2010In 1972, when I was 12, my Mom bought me a Bullworker exercise unit. I still use it to this day, owing to its 'bulletproof' quality construction and the heavy gauge metal of its tubing. The Dip Bar unit is of the same quality. As soon as I felt the heft of the delivery box I was pleasantly surprised. And when I saw the heavy gauge tubing of the unit I was overjoyed. After all, you never really know what to expect from an online purchase of an unfamiliar product. The unit snapped together intuitively and it disassembled just as easily (I have a small area to exercise in, and I must break down the unit after I have used it). As I turn 50 I look forward to a lifetime of use, and I well expect the unit to outlive me. And the Core Accessory Pack rounds out the unit perfectly, it also having the same high quality of the Dip Bar. Congrat's and many "Thanks". New Dip Station & Bodyweight Resistance Trainer Package5SteveFebruary 15, 2010I am very pleased with the dip bar. It is sturdy and just the right height . I am able to do chest and tricep dips now. I have also incorporated the push up straps into my routine and they are much more demanding than regular push ups..I highly recommend this equipment..
New Dip Station & Bodyweight Resistance Trainer Package5KeithFebruary 10, 2010I love this thing! Doing push ups with the rings is much harder than standard push ups. The first time I tried it I could feel my muscle fibers beginning to struggle after just 15 reps. And the pump you get from doing chest fly is incredible! I mainly bought this thing for doing dips - I had no idea the rings would add so much to my workouts. It's only been a few weeks, but I see greater definition in my chest - especially on the upper and inner parts of the chest, which can be hard to hit. I also love doing back rows with it. It works the upper back quite nicely and feels completely different from pull ups or bent over rows. And I definitely recommend elevating your feet on a chair or bench - or don't let your feet touch anything at all - much harder that way. This package also integrates nicely with P90X - especially the Chest & Back workout. And it definitely adds a lot more options to my ab workout. I have several different ways of using it to work my upper and lower abs as well as obliques. It seems like the more I think about it the more stuff I like about it! In fact, I just thought of a few other things I like... but I'm getting tired of typing. A couple of minor complaints - when I first put it together, it felt a little wobbly even after making adjustments. I thought this could be a problem... until I put my body weight on it - the bars instantly stabilized. And when it comes to folding it up for storage, you have to undo a couple of parts (unless I don't know what I'm doing) and I'd prefer it to be a little easier than that. But that's okay. I bought it to work out with - not store it in a closet. New Dip Station & Bodyweight Resistance Trainer Package5ChristianFebruary 4, 2010Very stable, sturdy, well designed product. Noticeably more defined and stornger in a short time. Multiple uses of body weight, are a . New Dip Station & Bodyweight Resistance Trainer Package5HARRY T.December 9, 2009THIS DEVICE IS NO JOKE! I THOUGHT I WAS IN SHAPE BUT THIS DEVICE SHOWED ME MY TRUE UPPER BODY STRENGTH, OR LACK THEREOF. THIS DEVICE IS THE TRUTH!!! New Dip Station & Bodyweight Resistance Trainer Package5A.S.October 29, 2009sturdy. nice grips. 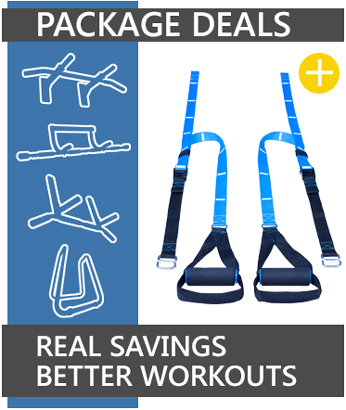 straps for pushups included. lightweight. looks nice. highly recommend. New Dip Station & Bodyweight Resistance Trainer Package5KimAugust 6, 2009I recently purchased the ultimate body press with pushup straps. I've been using it to do triceps and pec dips , pushups and divebombers. I really like the workouts. Great for the upper body and core. Takes up little space. Easy to assemble. Durable. Econ omical and simple. It was a great fitness investment for me. I would recommmend this equipment for fitness buffs who especially enjoy body weight exercises. I am a fitness buff and licensed physical therapist; I've seen and used a variety of exercise equipment. Utimate Body Press is one of my favorites. Thank you for your product. New Dip Station & Bodyweight Resistance Trainer Package5Mitch KompaniezMay 27, 2009This thing rocks! It was a snap to assemble perfectly. I've been able to do incredible tricep dips as well as chest dips. The optional rings take core control to another level. I wish I had this years ago. I've put together an awesome home gym. I am always on the lookout for equipment that'll allow me to train like I did when I went to at Gold's /Hollywod. Check out the article LA Times Health Section did on my home gym in 2003. The Ultimate Body Press is one of the smartest pieces of equipment in my gym. It is easy to use anywhere. New Dip Station & Bodyweight Resistance Trainer Package5JackApril 16, 2009I have been looking for a dip bar to use at home since I moved and no longer go to a gym. Dips are an essential exercise for people who do resistance workouts. This thing is great - easy to assemble and sturdy. Everything else on the market costs hundreds of dollars, is intended for a commercial gym, and is not portable. I'm very happy with the Ultimate Body Press and the push up straps I bought with it as well. Answer: The dip bar grips are 36 inch high (not adjustable) and 20-21.5 inches wide. Question: How much weight can this device support? I plan on using a weighted vest with it so it may be under stress loads of around 300+ pounds. Question: no DVD workout or guideline book? Answer: We have a complete online workout guide for free here. http://ultimatebodypress.com/dip-bar-pull-up-workout-guide.html. Question: Why do you only have size small? I wish to purchase the original size. Do you have any left? Answer: More on the way. They may be available as early as next week, no later than Feb 1. Question: i am 5"9 and want to order this dip bar pronto, would the small be fine or should i wait? Answer: Please wait for the Original. It may be available as early as next week. Question: I am a 5'1 female. Would the size small be appropriate? Question: when i do the push ups with the rings the straps are cutting me, am i doing something wrong? Answer: Try rotating the grips one half turn. Question: Will this product be available in the U.k? Question: Do you have a link with a video or advice how to set up the rings? How far off the floor, how to secure them? Etc. Question: Do you have a UK supplier? Question: Is there a weight limit on the dip station? Question: Do you have shipments to Mexico? Question: I'm Interested in the Dip station, but I have one concern. I'm petite and only five feet tall. Will the width of the handles be an issue for shoulders? Question: are these products available in europe also, or do you ship to europe / germany? Question: I wanna buy this however i live in oman in the middle east. Is it possible for you guys to ship it there? Question: Does it come apart for easier storage? Question: Hello! Do you ship to Israel? Thank you. Question: Hello. Whether deliver you this exercise machine to Russia? How many it will cost? Question: Hi, just wondering price and shipping for dip station to australia? Question: I live in Peru. I want to purchase this item while i am in the States this coming May and June. Does this Dip Station fold down or come apart to fit into a suitcase? or a large duffel bag? to take back with me to Peru? Answer: The dip station will fit in a large suitcase, but not a carry on roller board. Question: How long will this product be on sale? Thanks! Answer: The sale price will be available through summer 2012. Question: Is there a significant difference in size from small to original? I'm a 30 year female and my husband wants to utilize this as well. Answer: For multiple users of different heights we recommend the original size. Question: I can not find this product in Latin America, any clue? Im from Colombia! Question: What do this price includ this the original side and if is adjustable or you have a adjustable one. Question: I am 5'3 is the original ok or do I need a small one? Question: What is the dip station made of? Question: Do you ship to the UK?? Question: What are the shipping costs for shipping in the US? And is it really shipped in 1-2 business days? I was going to order the Dip Station from Amazon.com becuase they offer free shipping but it says it ships in 1-3 MONTHS! That's crazy! I'm starting a 30 day challenge soon and want to be able to use the dip station when needed. Answer: Yes, this item ships in 1-2 business days. To find accurate shipping rates please add the items you wish to purchase to the shopping cart then click "Proceed to Checkout". Enter your address, choose your shipping method and click "Apply". You only have to enter your country and postal code. You will not be asked to enter payment information or even your email address. If you have any more questions about shipping rates please email us using our "Contact us" page. Question: how much does it weigh and is it portable? Question: Hi. Can we order this from South Africa - I will pay the additional shipping fee if possible ? Question: i love my dip bar!!!!!! i use it everyday and my arms look fab!!!! Answer: Awesome. Big smiles at UBP for the kind words. Question: hi all, do you have shipping service to israel , what is the cost ? Question: When will the dip station and rings be available? Question: How heavy is this item? Answer: This package will be available on June 1. Question: Can I purchase this package now even though the improved push up rings won't be available until 6/1? I wish to receive the dip bar as soon as I can, and understand that the rings will arrive later. Question: WHEN WILL THIS PACKAGE BE AVAILABLE? Answer: Yes you can purchase them here. http://ultimatebodypress.com/dip-bar-pull-up-bar-fitness-europe.html To find accurate shipping rates please add the items you wish to purchase to the shopping cart then click "Proceed to Checkout". Enter your address, choose your shipping method and click "Apply". Make sure the items in your shopping cart are marked "- Europe" and choose the Shipping Method "Shipping - Europe". Question: Is Item #:DBpkg in stock? Question: What is the maximum weight this product can take? Thank you. Question: How much does this weigh in total? Question: does this item come fully assembled (i.e. solid)? or is it collapsable in nature? the dip bar, i mean. Question: How long doea it take to deliver this prodcut "Dip Bar & Push Up Ring Package - USA & Canada" to Italy? How much does it cost? Answer: You need to purchase from the Europe page. You can purchase from here. 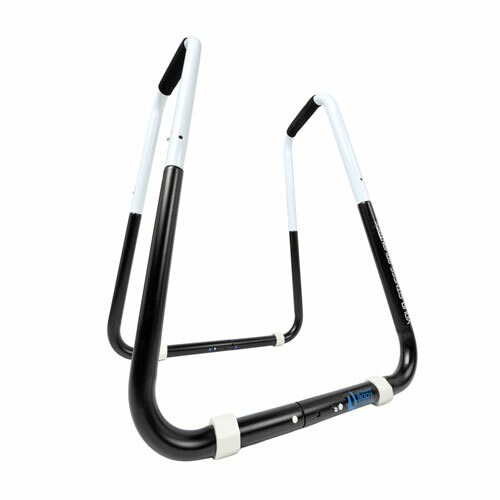 http://ultimatebodypress.com/dip-bar-pull-up-bar-fitness-europe.html To find accurate shipping rates please add the items you wish to purchase to the shopping cart then click "Proceed to Checkout". Enter your address, choose your shipping method and click "Apply". Make sure the items in your shopping cart are marked "- Europe" and choose the Shipping Method "Shipping - Europe". Question: i would like to purchase the regular dip bar station. where can i do this? i dont want to click on the wrong link and get the small dip bar. Answer: It is available right here on the site. Before you add the item to your cart please make sure the "Size" option says "Original"
Question: What is the correct adjustable width of the original dip bar? On this page (http://www.ultimatebodypress.com/dip-bar-and-push-rings.html) the q@a states 20 to 21.5. On this page(http://www.ultimatebodypress.com/ultimate-body-press-dip-bar.html) it shows 21 to 24. Answer: Here is a link to the size chart. http://ultimatebodypress.com/dip-station-size-chart.html With the most current sizes listed. The width has changed somewhat over time. Question: I need to ship the Dip Station to New Zealand.. what would be the size and weight of your product? Thanks! Question: What is the weight for this product please? Answer: The shipping weight of this package is 24 lbs. Question: I'm a female swimmer, height is 5'1. Is the width of this Ultimate Body Press Dip Bar too wide for me? I'm mostly interested in triceps so don't want the width to be too wide. Answer: We recommend the size small dip bar. 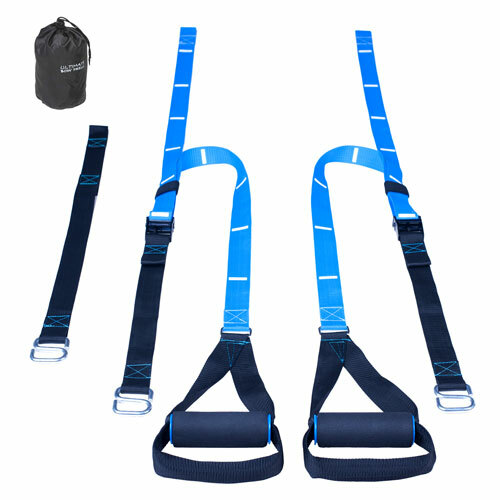 Question: The videos and pictures show the pull up rings with short straps. 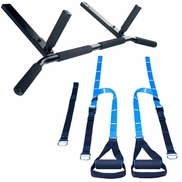 Are the rings included in this package the Pull Up Rings 2.0 as shown here: http://www.ultimatebodypress.com/pushup-rings.html with the velcro on the top and 7 ft straps? Answer: Yes, all Push Up Rings available in packages or otherwise are the 2.0 design with 7 ft straps They also include foot loops now as well which are not shown in the pictures. Question: Does the dip bar fold up to store it away easily? Answer: Yes, please watch the video under the specifications tab for a demonstration. Question: When ordering, how do I know if I'm buying the large or small version? it doesn't say anywhere. Answer: As of Jan 10 2013 we are only offer the Original size version. Question: Ordered, states comes with a message stating learn workouts on website, but cant see any geared towards rings. Answer: The push up ring exercises are featured in the Dynamic Strength guide. Please browse the pages and workouts listed there. Question: can you send your products to Mexico? ?, i,d like to purchase a dip bar, and how much the shippping would be? Answer: we do not ship to Mexico at this time. Question: someone asked about the original size dip stand not being available right now. Are there 2 sizes? Answer: No there is only one at this time. The dimensions are listed under the specifications tab. Question: What are the dimensions of the dip station when dismantled? Will it fit into a "road warrior's" suitcase? Question: I have my own doorway pull-up bar (the kind you slide on and off like sold here). Can I hang the push up rings from that and do trx and dips from it? Answer: Yes, the push up rings will work with your pull up bar.